We often get the question from interviewers: "How did a small company like Vector Unit end up with the Hydro Thunder license?" We usually give the short answer. But now that the Tempest Pack DLC is out of our hands and flying (I hope, flying) through Microsoft Certification, I thought it might be interesting to take a more in-depth look at how this whole thing started. My friend Ralf Knoesel and I met at Stormfront Studios, where among other things we worked together on a boat combat game for the first Xbox called Blood Wake. Blood Wake had its pluses and minuses, but the feature in the game that everybody on the team loved best was also the one feature that was almost completely hidden as an Easter Egg -- a multiplayer boat soccer game called Blood Ball. Years later, in 2007, Ralf was still at Stormfront and I was at EA. We were both feeling itchy in our jobs, and we came up with the idea of starting a little side project, something to work on in the evenings. We'd always been bummed that Blood Wake 2 never happened, in particular because the design spec called for networked multiplayer and it would have been twelve kinds of awesome. We figured we'd bust out a quick network-enabled Blood Ball tribute, stick it up on the Internets and see what happened. Well, it never happened -- turns out its pretty hard to make a game on the side when you have a regular job to work at, and a house to take care of, and friends and family to spend time with. We kept talking about it, but it kept not happening. "So I've been having these thoughts....about quitting and doing the small games thing." Every developer I know daydreams about taking the plunge: quitting your job and working on your own game. Most people don't do it, because, let's face it, it's scary as hell. How will you pay your mortgage? Where you will you get health insurance? And -- worst of all -- what if you spend months developing your idea and nobody wants it? We'd both saved up a little money, and we figured it would be worth the gamble. We gave ourselves 6 months to make a prototype. Worst case scenario, we'd spend 6 months working on something we loved, and if it didn't happen we figured we could give it up and go back to working for the Man. By January 2008 we'd quit our jobs, liquidated every personal asset we could live without, upgraded our PCs, and incorporated a new company -- Vector Unit. The first thing we did with the game was to throw our original concept out the window, with the irrefutable logic that we actually wanted to make a game that more than a few dozen people would want to play. But we stuck with the idea of boats. 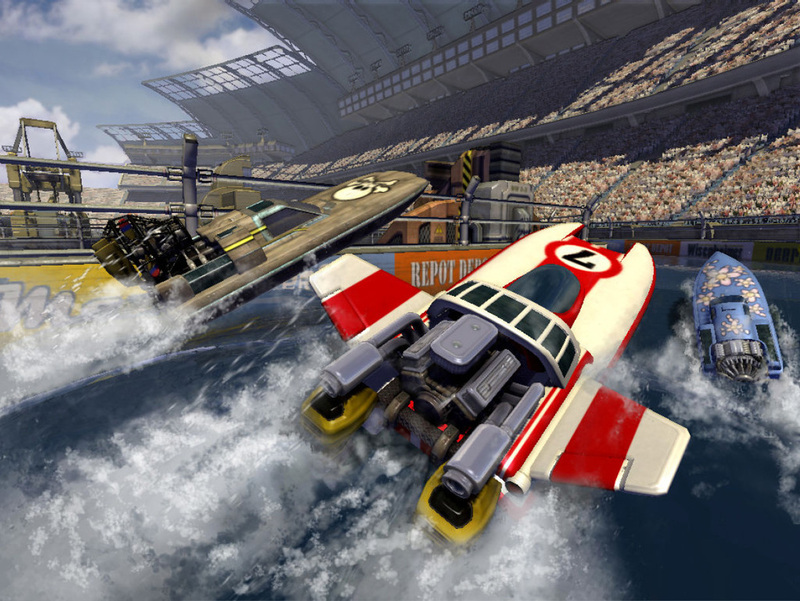 Ralf and I are firm believers in the emergent awesomeness of water-based gameplay, and aside from minigames in titles like WiiSports there hadn't been a decent water racing game in about 10 years. Plus with our experience on Blood Wake, we knew boat gameplay was something we could make happen. The game we set out to make was code-named Barracuda. The basic idea was speedboats meets Supercross in a futuristic post-global-warming flooded Earth. Gameplay was built around catching air off big wave sets and pitching your boat forwards and backwards to land perfectly on the next wave, or dip under it to shoot out the other side. You could also custom-build your boats from different parts that would affect how the boat performed. Is it Hydro Thunder yet? In July 2007 we started shopping Barracuda around. We took it up and down the West Coast publishing gauntlet, showing it to every publisher who'd give us the time of day. Eventually -- thankfully -- three publishers were interested, and one of those was Microsoft Game Studios. I won't go into all the why's and wherefore's, but let's just say we liked Microsoft's style, and the deal ended up happening with them. While we were hammering out the details of the publishing agreement, there was this one producer at MGS who kept talking about how with a few tweaks Barracuda would make an awesome Hydro Thunder sequel. At first we were like, yeah right, that'll happen. But the more we all talked about it, the more it started to make sense. It wasn't a complete no-brainer for us. Ralf and I both loved Hydro Thunder, but we also thought Barracuda had great potential as an original concept. Ultimately we decided that for our first game as a new company, we'd be better off going for the publicity and attention Hydro Thunder would bring to the game. In January 2009 we told MGS we'd be into making the switch if they could get the license. Right around that time Midway was going out of business. I don't know what all went on between them, but suffice it to say Warner Brothers bought the HT license from Midway, MGS was able to acquire the license from Warner, and we signed our deal with MGS in April 2009. There's a lot more that could be written about exactly what changes we had to make to our prototype to turn it into a worthy successor to Hydro Thunder. Barracuda was more about the physics and precision control -- Hydro Thunder is all about speed and spectacle. We had to tweak the physics and boat performance, and completely revamp our level design. Maybe in some future post if people are interested I'll go into the particulars of just how we broke down the Hydro Thunder design, what we decided to keep, what to throw out, and what to add. In the meantime, I still sometimes think about the game that Barracuda could have been. Who knows? Maybe someday it'll happen. Personally I think there's room out there for plenty more water racing action. I just hope we get more chances to add to the catalog.